I was a bit distracted and multi tasking for much of the game, and to be honest, at first, my heart was about as into it as my head. I did notice the irony of the 2 bald captains as they shook hands and then took the pitch. And then I was just speechless at Eddie Reja’s formation. I had just read how trendy the 3 man back line had become. I wasn’t sold on it, but this one had me second guessing myself. And it seemed like our guys were a little surprised by it, too, as they started off a little disjointed and lacking in confidence. That confidence should have taken a big hit in the 5th minute when Cissé took a great cross from Gonzalez to slam one home for Lazio. 0-1 Lazio. Insert acrobatic Cissé celebration for good measure. But after a shot by Lulic in the 8th, it seemed that Milan’s confidence went the opposite way, and they took control of the match, never looking back. The first indication that we were back in the driver’s seat was when Abate crossed the ball in, Merkel headed it, Robinho took it and with an absolutely beautiful left footed shot tucked it into the upper right hand corner of the net completely out of Marchetti’s reach. 1-1 all. Happy Birthday, Robinho. Now that’s what I call celebrating!! Of course, the ref made him take off his Snoodie afterward, but I really don’t think he cared. Just 3 minutes later, El Shaarawy tapped it forward beautifully for Seedorf who, after schooling the Lazio defense, slammed it home to make it 2-1 Milan. El Shaarawy would not get on the scoreboard tonight, but he did everything else he could except score. He passed and crossed and dribbled and actually took a number of shots. His positioning and sense of where his teammates were was absolutely uncanny. He played so well I almost forgave him that frightening haircut. Almost. But definitely my Man of the Match. And I would like to appeal to Allegri at this point to start him in some of the big games. He may be 19, but he is too big for just the Coppa. Say what you will about his pace, but nothing stops those rockets. The debut of Mesbah… I noticed in the beginning that he was a bit timid. And as for playing wide, he was literally on or outside of the touchline a number of times, not seeming to know what to do with Nocerino sometimes. But as the game progressed, his confidence seemed to grow. His crosses were beautiful. He seemed to get forward enough, even if he didn’t really create a goal or anything. But he also seemed to get back at all the right times and defend well enough, too. Plus, his ball handling skills were very strong. And so I would like to make my intentions clear right now: our search for a LB is over. He should be number one. Yes, after only one game. Because what I saw today was more promising than all of our other “left backs” combined. So there. Allegri, you’re on notice. Amelia had a great, too, and he came up big whenever called upon. Like in the 44th minute, a Hernanes free kick that would have gone in 9 times out of 10, but Amelia was having none of it. Or the 73rd minute trajectory from Cissé. Not on Amelia’s watch. Bonera, on the other hand, seems to be regressing again. (sigh.) He earned himself a yellow in the 43rd, which was silly, we’ll need everyone we can get in the semifinals. Van Bommel also earned himself a yellow in the 70th, for trying to clothesline Hernanes. How else do you stop that guy? Our attack was formidable. Shot after shot, great interplay getting the ball into the box, and it was pretty, too. Poor Lazio tried to save the match, but it was too little, too late. Ledesma came on for Diakité at the half, at which point it seemed they switched to a 4-3-1-2. Which definitely seemed to help a bit, but not enough. After an exquisite cross in from Merkel in the 50th which El Shaarawy was just unable to get to, the ugly part of the match happened: Dias punched van Bommel in the head while they were mixing it up in the box, but the ref apparently didn’t see it. Shameful. Klose came on for Rocchi just after that, but in the 65th was when we saw a little magic. El Shaarawy took what seemed to be a roundhouse kick shot a la Ibra, but unfortunately, his finishing was more like Robinho’s. Still, breathtaking. And just one minute later, bad news, Merkel took a nasty knock to his knee. I don’t care if you’re religious, I want you all to pray it’s nothing serious. So Ibra replaced him in the 70th, and it was game over for Lazio, they had to know it. 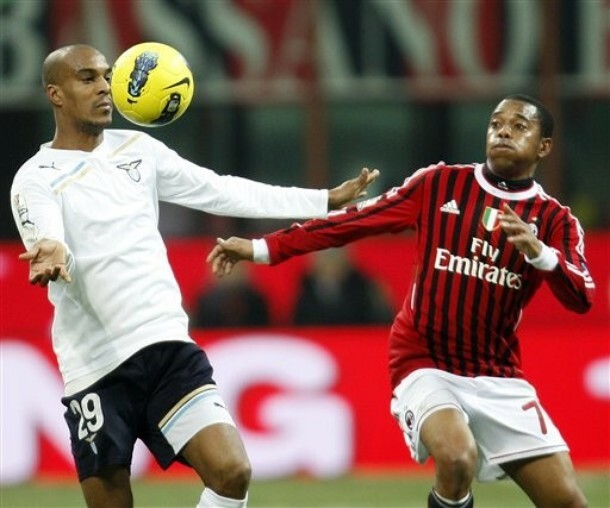 While I would have loved for Pippo to get some time, especially since he’d been warming up after being fully masked the first half, Allegri instead brought Emanuelson for Seedorf in the 74th, who once again had probably played about 20 minutes too long. On the flip side, Abate was given the captain's armband for the first time. Best Forward, Best Foreigner, and Best Player in Serie A. No shame in that, Marchetti. But it was in the 84th that Ibra killed Lazio’s Coppa dreams, with a great assist from Urby. It was probably offside, but the ref kept the flag down, and it wasn’t a game decider, it was a game killer, so I just don’t want to hear about it. In the 89th, Calvano came on for Robinho, which was a little too late to see what the youngster could do. Lazio tried their best in the waning minutes, even Klose in the 2nd minute of stoppage time, but it was just wide. Nocerino, who had played well, but was relatively unnoticeable most of the game, took a shot from distance, but sent it over the crossbar. And then the game ended the same way the first half did: with a shot attempt from il Faraone. Walk Like an Egyptian. My match was commented by the frightening George di Michelis and Gino Puentes of GOL TV, who I think might be those neighbors who coach their little ones in AYSO but are waiting for Guardiola to step down and Barca to call. This might be why I didn’t enjoy the game as I should have. From their “Urby and Robinho look so much alike, they even where the same funky colored shoes” comments to their unspeakable lack of knowledge of Offside rules and their suggestion of a “better” way to call them, it was one 90 minute facepalm for me. Additionally, their idea of color commentary included the comment “Ray Charles could have seen that one” on an offside call. Or when they said Pippo should come on for “Madrid” and didn’t even catch it. But perhaps the most telling was their sheer hatred of van Bommel, who I had to hear about what a ruthless babykiller he was anytime he was shown on screen. So when Dias punched him in the face, they went on and on about how it must have been “provoked” and how van Bommel “always gets in your head.” Clearly, they’ve only seen him play once before, and it’s been a few years. I would just like to say that here are 2 exhibits as to why football will never succeed in America. Okay, sorry, rant over. Maxi Lopez may not be officially a Milan player as of this writing, his fate is supposed to be known tomorrow. But one advantage of being holed up in a Milan hotel all week waiting was to see the team play up close an personal. So it made me wonder, is the transfer problem that we’ve already filled our blonde player quotient? Just wondering. Speaking of blondes, Abate and Merkel need to play together more. There were several times they just didn’t quite communicate and missed some good opportunities. But that is definitely something that will come, and probably quickly, too. Sorry, Konko. Even your mad skills could not save the S.S. Lazio from sinking. Still, we made it to the semifinals. With 2 chances to beat Juve in the next 2 months, (plus our regular league match with them in there, too) it will really test our depth as we also head in to our Champions League season. Abbiati is likely for Sunday, and Boateng will only be another 7-10 days instead of weeks as originally thought. It is hoped that Aquilani may make it back before we face Arsenal, too. If we survive these matches, we really will be Champions, even if the league table may say differently. Tonight was a great showing of that strength, and I was freshly impressed with our ability to control the match and score almost at will. The only thing missing was scoreboard glory for El Shaarawy. Lord knows he earned it. Forget the Brazilian samba celebrations, when il Faraone gets on the board, as we know he will, we should all Walk Like an Egyptian.